What is a hyperboloid green facade? A “hyperboloid” is a solid or surface having plane sections that are hyperbolas, ellipses, or circles.In geometry, a hyperboloid of revolution, sometimes called circular hyperboloid, is a surface that may be generated by rotating a hyperbola around one of its principal axes. A hyperboloid is a surface that may be obtained from a paraboloid of revolution by deforming it by means of directional scalings, or more generally, of an affine transformation. Sound complicated? Well it is! 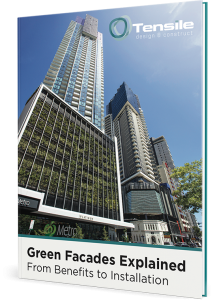 We were engaged as a consulting company to work on Melbourne’s One Flintoff project, to design and engineer a hyperboloid green facade, and then later build, supply and install the facade. Melbourne’s suburban streetscape has changed significantly in recent years, and it is revolutionary projects such as this that are taking modern building design to a completely new level. The project has seen four new levels added to the top of the existing WaterMarc Aquatic Centre that will house Council staff accommodation and office facilities. This dynamic design includes a 3D hyperboloid green facade that folds over the building to become a roof at higher levels. The mesh roof then cascades down into the planter bed; the home of the climbers that will reside on the mesh. The hyperbolic shape of the facade is structurally quite difficult to create. Whilst it would have been challenging to make this creation with any other kind of material, it was easy to create with our unique Webnet mesh that is flexible and highly adaptable. It works perfectly as a substrate or trellis for climbing plants, and will add shade and an inviting atmosphere to the building. 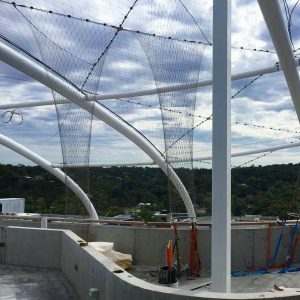 Due to be completed in April 2017, the curves of this design will look stunning once the plants have grown and matured to cover the roof of the structure. To find out more about the construction of this green facade, please call us on 02 9999 3668 or visit us here.